Danny Waters Jr and crew rolled up to Budds Creek MD with one thing in mind, bringing home their first National Event 'Iron Man' of the 2008 IHRA Knoll Gas Nitro Jam racing series. When the smoke cleared, they had done just that! 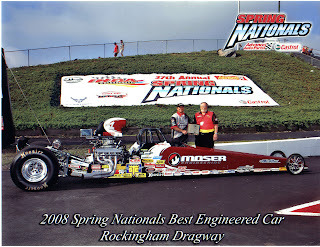 'This Moser Engineering, 2008 American Race Cars dragster was on a mission this weekend!. Eventhough the track surface was extremly hot, these Hoosier Racing Tires kept us hooked up with consistant 60 foot times all day long'. This final round win should bost the Moser Engineering Quick Rod entry solidly into the top of the National Points standings with room still left to improve.